Y’ALL. The Oreo obsession is real. It’s been a long time coming with this cake. I had the idea for it awhile ago and finally took the time this past weekend to make it happen. 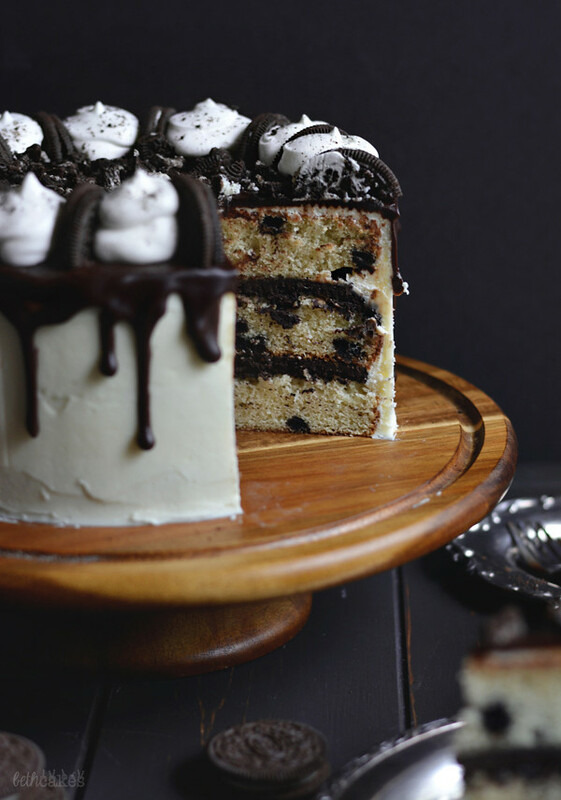 I envisioned a white cake speckled with little Oreo chunks and cream cheese frosting all over the outside. 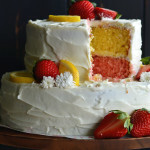 But it’s the filling between the cake layers that originally sparked this idea. Yeah. Like the little Oreo balls covered in chocolate. I can’t make those things anymore because I always end up eating half of them. Not very good for my 2016 resolutions. I got a little crazy with the decorations on this thing. I feel like that’s okay, though. 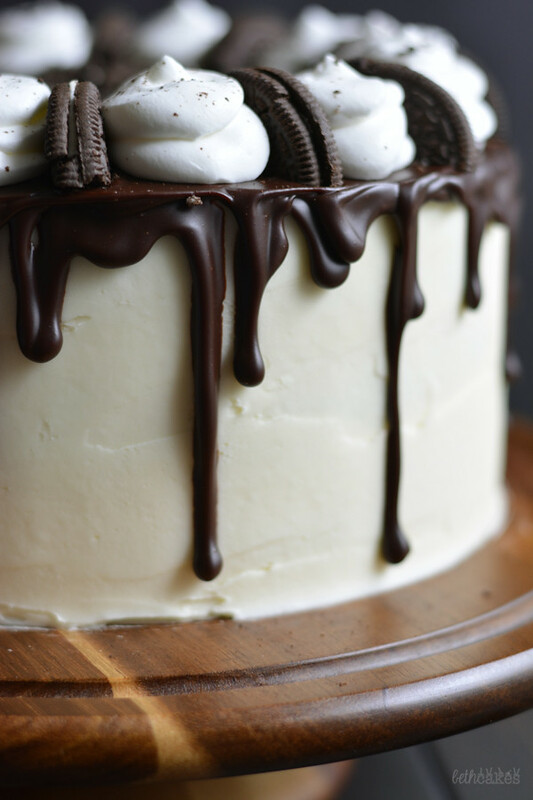 Cause who’s gonna turn down a slice of cookies and cream cake with truffle filling AND cream cheese frosting AND chocolate ganache AND Oreo pieces AND homemade whipped cream? To be 100% honest, after making this cake, my kitchen looked an Oreo factory exploded in it. Crumbs everywhere, frosting on the walls, ganache shoe prints on the floor. Anyways, I have major #sparklyheartemoji feels for this cake, and I hope you will too! Preheat oven to 350*F and spray three 8-inch round cake pans with nonstick spray. Line pans with parchment paper and spray again. Combine flour, baking soda, and baking powder in a bowl. Whisk together and set aside. Cream butter on medium speed with an electric mixer until smooth and creamy. Add sugar and vanilla; mix until fluffy. Add egg whites and mix well. Add half of flour mixture and half of the buttermilk. Mix until ingredients are just combined. Repeat with remaining flour and buttermilk. Mix until completely combined. Fold in chopped Oreos. Divide batter among the prepared pans and bake 18-20 minutes, or until a toothpick inserted into the center of each cake comes out clean. Let cakes cool in pans for 5 minutes, then transfer to a wire rack to cool completely. Cream butter and cream cheese on medium speed with an electric mixer until smooth and creamy. Add half of powdered sugar and the milk; mix well. Repeat with the second half of the powdered sugar. Add Oreo crumbs and mix until incorporated. Divide filling in half and spread one half over one cake layer. Place the second cake layer on top and spread with second half of filling. Place third cake layer on top of that. Cream butter and cream cheese on medium speed with an electric mixer until smooth and creamy. Add half of powdered sugar, and all of the vanilla and cornstarch; mix well. Add second half of powdered sugar and mix well. (Add 1-2 tbsp milk/cream if frosting is too thick.) Cover cake with frosting. **I like to chill my cakes before pouring ganache over the top, so if you'd like to try this, just remember to put your cake in the refrigerator for about half an hour. Place chocolate chips in a heatproof bowl. Heat cream in a small saucepan over medium low heat until it's barely simmering. Pour cream over chocolate chips. Let the cream sit for 5 minutes, then stir until smooth. Pour about a cup of ganache on top of the cake and use an offset spatula or knife to smooth it out to the edges. Add more closer to the edges if you need to coax it over the sides. (It's easier to start out with a little and add more if you need it.) Then, if you'd like, transfer remaining ganache to a piping bag or Ziploc bag with a tip cut off. 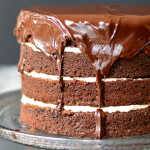 Add extra chocolate drips by placing the tip just over the top edge of the cake, piping a small bit of ganache, and let it fall down the sides. Whip cream on high speed (with the whisk attachment if using a stand mixer) until soft peaks form. With mixer running, add vanilla, and then slowly add the powdered sugar. Mix until stiff peaks form. 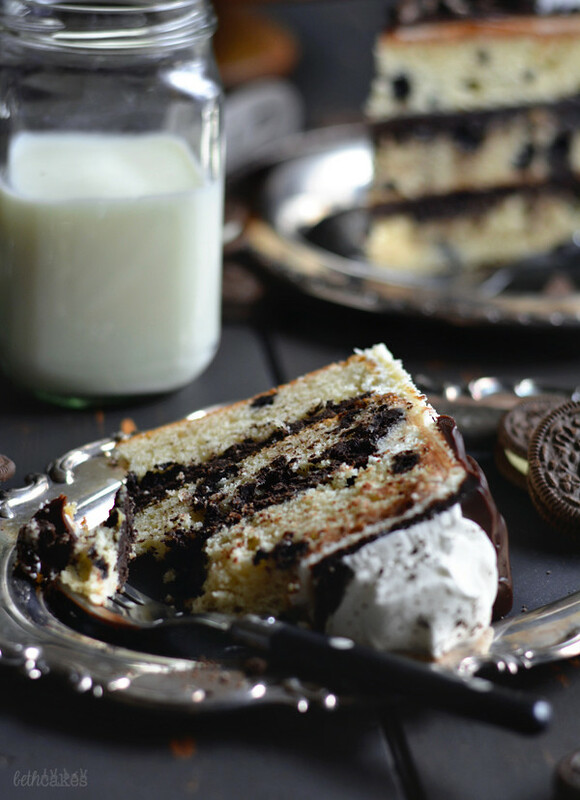 Arrange Oreo crumbs or Oreo halves over the ganache. Pipe whipped cream around the edges of the cake. 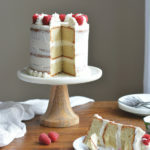 cake layers adapted from Life Love and Sugar. Thanks so much, Megan! You’re so right, splitting it into two days is the way to go! This cake is EVERYTHING. Oreo heaven. I totally have heart eye emojis for that filling too – it’s BRILLIANT! Love this so much. Wowza Beth!! This cake is incredible!!! I mean seriously – both in looks and I can only imagine how delicious it is! 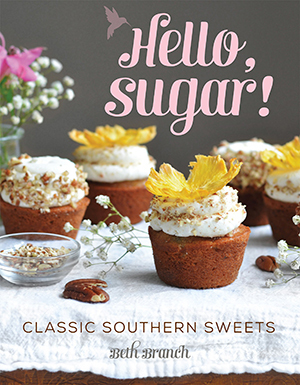 This is so beautiful, Beth, and it sounds SO delicious! Too much. This cake looks over the top. Oh my god, you filled it with Oreo truffle!!! Be still my heart! Oh my gosh. Stunning. 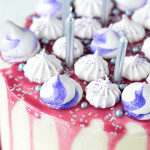 And the decorations are perfect for a cake like this, it’s not like you’re looking for refined elegance in an oreo cake. Over the top chocolate drizzles is exactly the right call to top that beauty off. And I totally feel you on ‘3rd time cleaning the stand mixer’ haze. I get that too. WOW, Beth, you always make the best cakes! 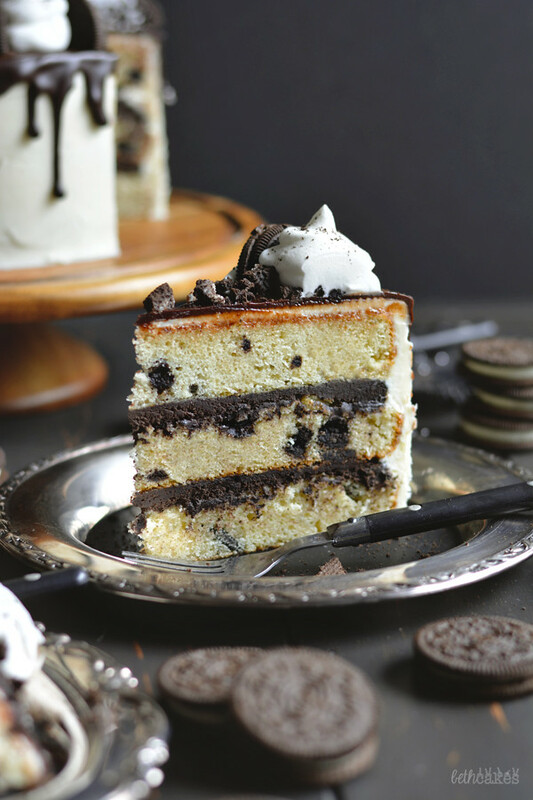 This looks heavenly, and that oreo truffle filling?! I’m totally here for it! 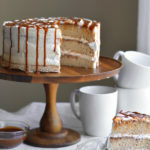 Wow Beth this looks delicious.Question:Does leftover cake need to be refrigerated once sliced or can it be left out in a cake keeper on the counter ?? 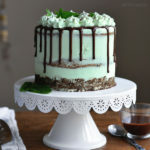 I saw this gorgeous cake on foodgawker and I just had to come and leave a comment. Love love love love it. Beth, will this recipe work OK if I half the amounts to make a smaller cake? I tried this today. Complete fail. Cake layers had no flavor and were a weird consistency. Crumbled away and had an oily feel. I made the oreo truffle filling (before I knew the layers didn’t work) and even with additional oreo crumbs the filling wasn’t the rich dark chocolate look portrayed in the photos. Never got to the frosting or ganache since the cake went down the disposal. ? Hi, Sharon! I’m really sorry this recipe didn’t work out for you. I’ve used the recipe for the cake layers in several other cakes that I’ve made and they’ve always turned out fine for me. The only thing I can think of is that the batter was over-mixed, but I’m not suggesting that’s what you did by any means. I don’t really have a way of knowing what went wrong. I know it can be frustrating to go through the trouble of buying the ingredients and then the whole process of making a cake, so I’m really, very sorry that it didn’t turn out for you. I’ll retest the recipe if I have a chance, but it’s always worked out for me. Again, I’m very sorry. I made this cake for my brother’a birthday and I declare it was one of the best cakes I have ever made and tasted! The cake itself was super yummy, with the little chunks of cookies and the moist cakey goodness. The highlight of the cake, however, was definitely the Oreo truffle filling! My family was scraping that stuff straight out of the bowl, and it was a perfect compliment to the cake! Thank you for the recipe, this is definitely a bookmark! I made this cake today. Baked it last night, assembled this afternoon. Really quite easy to make, just time consuming. I did make a couple of changes. Added an extra 1/2 cup of oreo crumbs to the truffle filling, and used vanilla paste instead of extract throughout. The only issue I had was the ganache was a little thick and didn’t drip properly. Now I must return to guarding the kitchen so my son doesn’t cut into this thing before dinner! I’m really upset. There is something very off about your recipe. I doubt you will remove this from your blog due to the traffic it must drive in but I feel like it’s cruel and irresponsible to keep it up. I hope you will at LEAST edit in a warning of some kind so other people don’t waste their hard-earned money and precious time. I originally read the comments and dismissed the negative comment about the cake turning out oily and a weird consistency. I chalked it up to “HA, probably over-mixed or did SOMETHING wrong.” But me? I’m meticulous. I measure everything, temp everything, and don’t over-mix. Yet the cake layers were absolute garbage. I called my boyfriend in and he laughed and asked “what’s that supposed to be, some kind of corn bread?” it was oily. it was the strangest consistency I’ve ever seen. It definitely wasn’t cake. It was a sad and desperate cake masquerade, if anything. I am angry that I drove to the store to buy all of these ingredients. I am angry that I wasted money, especially considering I’m struggling as it is. I am angry that the cake I was going to bring to the New Years get-together tomorrow is in a trash bag instead of in my fridge. I am angry that I wasted all of this time and put in so effort into something that is in the trash. I wanted to do one nice thing to end this year… I am angry. And it spiraled into me being in a bad mood and causing tension in my household. I really REALLY hope you put a warning in. The photographs you put up are beautiful but far from realistic. The recipe is off. This is false advertising dude, and it’s unfair. For what, traffic? Likes? Shares? I’m still so angry, that I literally cannot sleep. Hi Tonya, I’m sorry I’m just now seeing your comment. It ended up in my spam comment folder for some reason and I only check that every now and then. I know it’s been several months, but I still wanted to take the time to respond. I understand that you were angry and I’m honestly and genuinely sorry this cake did not turn out for you. I am one little human running this blog for the fun of it. I don’t do it for likes, or shares, or pageviews. You don’t know me, and I don’t know you, so I do not appreciate you suggesting that I have ulterior motives for posting pretty pictures with a crappy recipe. To say that this is false advertising is absurd, especially since this recipe has turned out fine for other people who have made it. I understand that you were angry because you wasted time, effort, and money on a recipe that did not work, and trust me, I’ve been there. When I test recipes for this blog, there are times when the recipes fail and I have to decide if I want to spend money on the ingredients again, or move on to something else. Because I also struggle. I understand where you’re coming from. This cake turned out fine for me, otherwise I would not have posted the recipe. Now, this recipe has gotten good reviews and bad reviews, so I’m really not sure what to think. Someone made it recently for Valentine’s Day and left a glowing review. I have no way of knowing if what one person did differs from what you did, or why the results were not the same. But since this recipe now has two negative comments, I decided to retest it. The batter was thicker than I remembered and the cake came out a little dense, but it certainly wasn’t oily or similar to cornbread in any way. I decided to adjust the recipe slightly to thin out the cake batter a little bit, but that’s all. There are plenty of positive reviews on this post, so I will not be removing this post from my site or adding a warning anywhere in my recipe. But I will leave your comment here along with the other negative one so people can decide for themselves if they want to make the recipe or not. Again, I’m very sorry this cake did not work out for you. 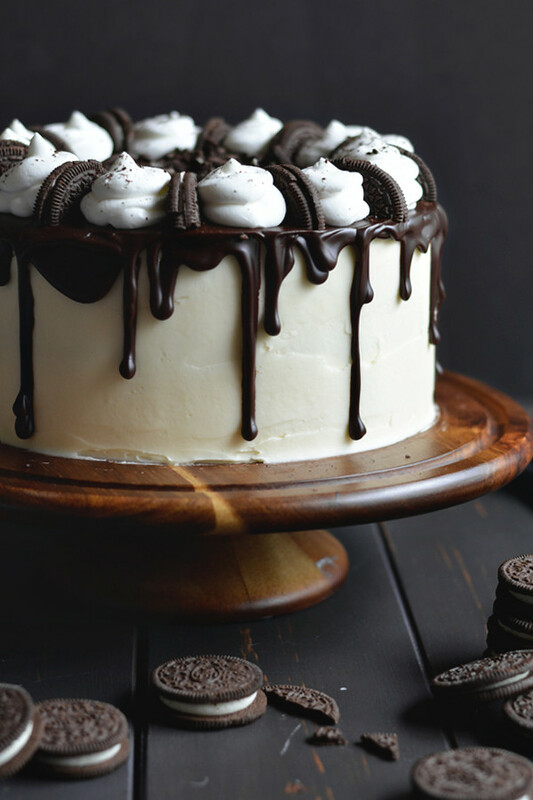 Cake looks really yummy, I will make this weekend.When you make the Cookies and Cream Oreo cake, do you leave the white filling in the middle of the Oreo’s, when you chop them up? Yes! I left the filling in them. 🙂 Hope this helps! Made this cake for Valentine’s Day. Followed the recipe, except added an xtra 1/2 Oreo to the truffle. It was very easy to make. This cake came out perfect! It was so good. I will be making it again in a few weeks, but instead of 3 8″ layers, I will make 2 9″ layers. Thanks for sharing this recipe. Oh yay! I’m so happy to hear that! 🙂 I apologize for not responding to your first comment earlier, it slipped passed me somehow. Glad you enjoyed it, though! If I use a 9 inch cake pan will have to double the recipe? Hi Tesha! I don’t think you’d have to double the recipe at all! I think you could bake it in two 9-inch cake pans for about the same time. Maybe bake for 25ish minutes and check on it periodically to make sure it’s done. I hope this helps! Hi i was wondering why you use just the egg whites instead of the whole egg? can you use the whole egg? Hi, Monica! I only used egg whites because I wanted to make a white cake and not a yellow cake. You can certainly use the whole eggs, the cake will just be more yellow. If you decide to go with whole eggs, I’d probably use 3 instead of the 4 egg whites. I haven’t tried that with this recipe, so I’m not sure how much it will effect the texture of the cake. Just keep in mind that it might come out a little different than the picture. I hope this helps! Hola Beth. Te escribo desde Veracruz, México. Estoy a punto de abrir una pastelería, pero siempre he buscado en mi cocina sabores nuevos y frescos, hecho con mucho amor. Hoy, en una emergencia, me aventure a elegir tu receta para recrearla y hacerla un poquito mía. Así lo hice y el resultado me encantó! Fue un pan super esponjoso, nada seco, un filling delicioso y el buttercreme exquisito. Así que muchas, muchas gracias por tomarte el tiempo para escribirnos a todas las almas antojadizas y compartirnos tus recetas (y secretos). Gracias desde el fondo de mi corazón. For this recipe, in the ingredient list it says it requires 1 1/2 cups of milk. In the recipe directions, you stat to add the “buttermilk” to the mixture alternating with the flour mixture. There is no mention of buttermilk in the ingredient list. Which is it? is it milk or buttermilk?? As I am already in the middle of making this, I will use milk to be on the safe side. Hi, Sandra! So sorry about that. The original recipe had buttermilk in it, but I retested it after there were some complaints and change it to regular milk. I forgot to change it in the directions, though! Sorry about that, but thanks for pointing it out. It has been corrected!